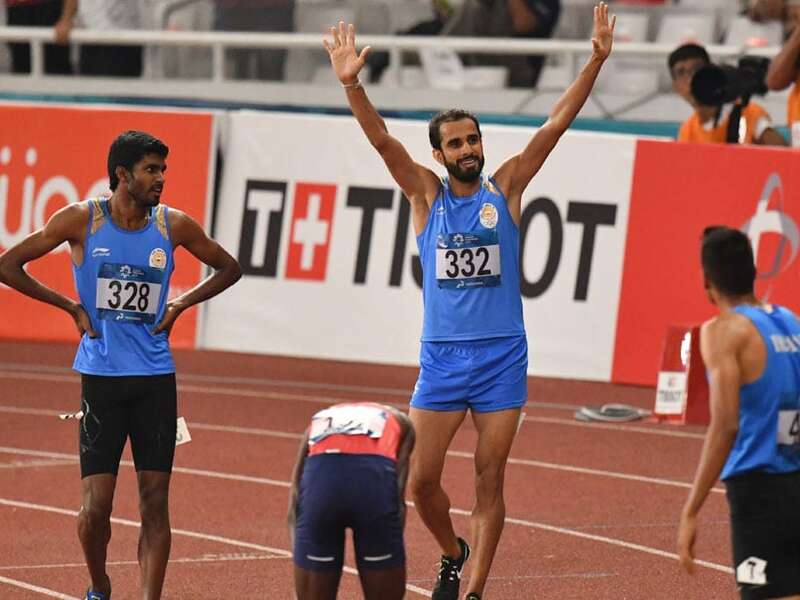 Live updates of Asian Games 2018: India won one gold and one silver in men's 800m category. 19:55 IST: Thank you for joining us on all the live action. Join us tomorrow again on all the live action from Day 11. 17:58 IST: Kurash: India's Malaprabha Yallappa Jadhav lost 0-10 against Uzbekistan's Gulnor Sulaymanova 0-10 in the Women 52 kg semi-finals. 17:22 IST: Dutee Chand clocks 23.00 to top Women's 200m semifinals. She qualifies for the final. 16:50 IST: KURASH: India's Pincky Balhara defeats Indonesia's Susanti Terry RR 3-0 in the Women 52 kg Quarterfinals match. She has qualified for the semifinals. 16:11 IST: HOCKEY: GOAL! Mandeep Singh scores as India take 20-0 lead against Sri Lanka. 16:03 IST: HOCKEY: GOAL! Rupinder Pal Singh makes it 16-0 for India against Sri Lanka. 16:00 IST: HOCKEY: GOAL! Rupinder Pal Singh scores his second goal of the match, India take 15-0 lead against Sri Lanka. 15:42 IST: HOCKEY: GOAL! Amit Rohidas scores. India 12-0 Sri Lanka. 15:34 IST: HOCKEY: GOAL! Mandeep Singh scores from penalty corner as India take 11-0 lead against Sri Lanka. 15:32 IST: KURASH: India's Malaprabha Yallappa Jadhav beats Turkmenistan's 3-0 Zarina Saparova in Women's -52kg Round of 16 match. 15:15 IST: Saina Nehwal posts picture with the Asian Game bronze medal. 15:14 IST: HALF-TIME: End of 2nd quarter, INDIA 7-0 SRI LANKA. 15:00 IST: HOCKEY: GOAL! Akashdeep Singh scores his fourth goal as India take 7-0 lead against Sri Lanka. 14:59 IST: HOCKEY: GOAL! Hat-trick for Akashdeep. India take 5-0 lead vs Sri Lanka. 14:54 IST: HOCKEY: End of Quarter 1: INDIA 4-0 SRI LANKA. 14:47 IST: HOCKEY: GOAL! Akashdeep scores again as India take 4-0 lead vs Sri Lanka. 14:46 IST: HOCKEY: GOAL! Akashdeep Singh's 10th minute goal gives India 3-0 lead against Sri Lanka. 14:39 IST: HOCKEY: GOAL! Another goal for India. Harmanpreet Singh scores. INDIA 2-0 SRI LANKA. 14:36 IST: HOCKEY: GOAL! Rupinder Pal Singh scores as India take 1-0 lead against Sri Lanka. 14:30 IST: HOCKEY: Indian men's team faces Sri Lanka in their Pool A match. 14:04 IST: BOXING: India's Pavitra loses 2-3 to Indonesia's Huswatun Hasanah in women's Light (60kg) quarter-final bout. 14:01 IST: BOXING: India's Pavitra is in action against Indonesia's Huswatun Hasanah in women's Light (60kg) quarter-final bout. 13:50 IST: BOXING: India's Sonia Lather loses 0-5 to DPR Korea's Hwa Son Jo in women's feather (57kg) quarter-finals. 13:25 IST: MEDAL ALERT: India take home bronze after losing to South Korea in men's team table tennis semifinal. 12:55 IST: MEDAL ALERT: PV Sindhu loses 13-21, 16-21 in the final, wins Silver. 11:42 IST: MEDAL ALERT: India Win Silver In Women's Compound Team Archery. India lost 228-231 to Korea in the summit clash at GBK Archery Field. 11:21 IST: The Compound Women's Team Gold Medal Match between India and Korea is underway. 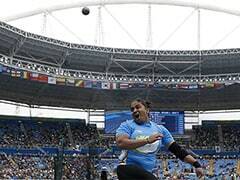 10:47 IST: HEPTATHLON: Swapna and Purnima will be in action in Shot Put in some time. 10:45 IST: HEPTATHLON: Swapna Barman ends up with 1003 points in high jump. She finishes on top in the event. Purnima Hembram, the other Indian in the fray, finishes 5th with 891 points. 10:30 IST: HEPTATHLON: India's Swapna Barman fails in all her three attempts in 1.85 in High Jump. She is still on top of the chart. 10:10 IST: HEPTATHLON: India's Swapna Barman is on top of the chart after a successful 1.82 attempt in High Jump. 09:53 IST: SQUASH: India beat Thailand 3-0 in their women's team pool match. They will play Indonesia later in the day. 09:30 IST: SQUASH: India take 2-0 lead against Thailand in their women's team Qualification match. 09:10 IST: SQUASH: The women's team pool match against Thailand is underway. India are leading 1-0. 08:45 IST: ATHLETICS: India's Hima Das also qualifies for women's 200m semi-final. She finished fourth in heat but qualified by time. 08:40 IST: ATHLETICS: India's Dutee Chand qualifies for women's 200m semifinal. She clocked 23.37 in Heat 4. 08:39 IST: ATHLETICS: Women's 200m Qualification featuring India's Dutee Chand is underway. 08:25 IST: ATHLETICS: India's Hima Das fails to qualify for Women's 200m semi-finals. She finished fourth, clocking 23.47. 08:19 IST: ATHLETICS: Women's 200m Qualification featuring India's Hima Das is underway. 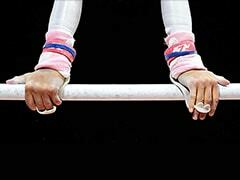 08:15 IST: HEPTATHLON: Women's Heptathlon featuring India's Purnima Hembram and Swapna Barman is underway. 08:12 IST: EQUESTRIAN: Indian team (Kevic Kaevaan Setalvad, Chetan Reddy Nukala and Zahan Kaevaan Setalvad) are in action in Qualifier 1 of Jumping Team event. 08:10 IST: CYCLING: India's Deborah finishes fourth Heat 1 of Round 1 of Women's Keirin. She was 1.798 seconds behind the leader, Wai Sze Lee of Hong Kong. The Indian has moved to the repechage round. 07:50 IST: CYCLING: Heat 3 of Women's Keirin Round 1 featuring India's Sonali Chanu is underway. 07:45 IST: EQUESTRIAN: Jumping individual Qualifier 1 featuring India's Kevic Kaevaan Setalvad, Chetan Reddy Nukala at Jakarta International Equestrian Park is underway. 07:30 IST: Hello and welcome to the Live coverage from Day 10 of the Asian Games 2018. In Archery, both the men and the women compound teams will fight for the gold medal. In both events, India will be up against Republic of Korea. There are two boxing matches scheduled on Tuesday with Sonia Lather take on DPR Korea's Jo Son Hwa in the quarterfinals of Women's Feather 57kg category. Pavitra will be up against Indonesia's Hasanah Huswatun in the Women's Light (60 KG) Quarterfinals. In the afternoon, the Indian men's hockey team will play their final group match against Sri Lanka. The Indian team has been phenomenal in the tournament, scoring a total of 56 goals in the four matches played so far. In the evening, there will be four medal events in athletics. While Annu Rani will feature in the women's javelin throw final start list, Manjit Singh and Jinson Johnson will be in fray for a medal in men's 800m final. With Suriya Loganathan and Baburao Sanjivani in the women's 5000m final start list, India will also expect a medal in the mixed 4 x 400m relay final.